Seton Hill University’s (SHU) singing competition SHU Idol filled the walls of Lowe Dining Hall with vocals, live music, comments and cheering on March 26. Students competing performed two songs for the audience. Live band, Maxxtone, performed the music as contestants sang along. “I really enjoyed SHU Idol. I was surprised that the turn out was so great. 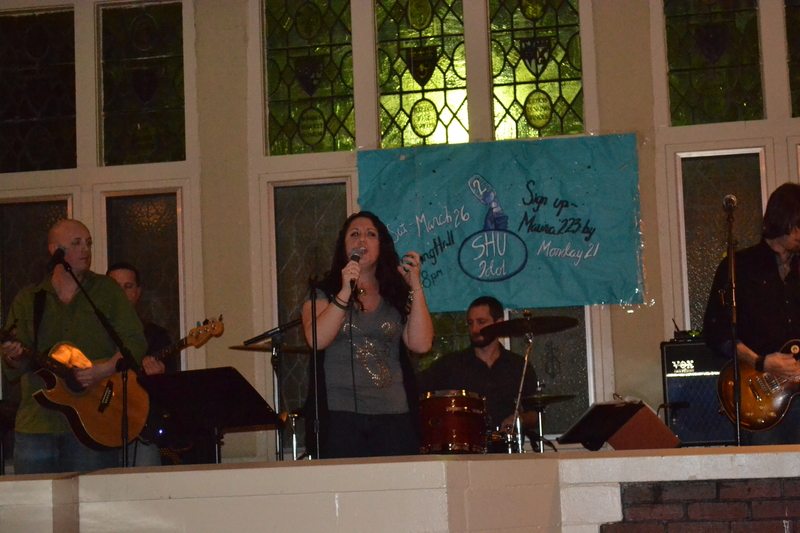 The band was phenomenal and the student singers were better than I anticipated,” said sophomore Amanda Mientus. A panel of three judges commented and critiqued participants on each of their performances. Judges included Robin Anke, Sister Maureen O’Brien and Rev. Von Schlichten commented after each song. Judges’ comments ranged and some audience members thought they were too strong. Several competitors brought their iPads on stage to follow along with the lyrics. The dining hall was over half full for a Saturday night as students listened for more than two hours. Once all the participants sang, there was an intermission where the band performed. Three finalists then sang one more song as judges commented. The top three finalists were Alexi Swank (first), Jackie Yanchuck (second) and Sean Alan (third). The second and third place finishers received an iHome with a SHU bookstore gift card. The first place finisher received an iPod compatible home stereo system and a bookstore gift card.